This spice formula is taken from the gSo-ba Rig-pa the science of healing and has been used for thousands of years for aromatic taste, to balance and soothe digestion. It can be added to soups, stir-fry, vegetarian and non-vegetarian dishes. 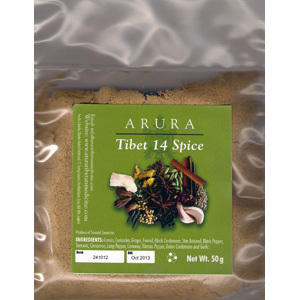 Ingredients: cumin, coriander, ginger, fennel, black cardamon, star aniseed, black pepper, tumeric, cinnamon, long pepper, caraway, Tibetan pepper, green cardamon and garlic.